Berwyn South School District 100 set the Breakfast After the Bell Program trail ablaze about 8 years ago by instituting Breakfast in the Classroom. The district is composed of eight schools: six elementary schools – Emerson, Hiawatha, Irving, Komensky, Pershing and Piper & two middle schools – Freedom and Heritage. The Business Manager Jennifer Hosty & Food Service Coordinator Toni LeGare sat down with Rise & Shine Illinois to talk about their Breakfast After the Bell Program and how the Community Eligibility Provision (CEP) has helped to increase breakfast participation in the district. Q: How was Breakfast served before starting Breakfast in the Classroom? A: Breakfast was served before class started in our gyms which double as multi-purpose rooms. Q: What prompted the school district to transition away from the traditional breakfast model? A: Some students would arrive at the bell just making it to class. 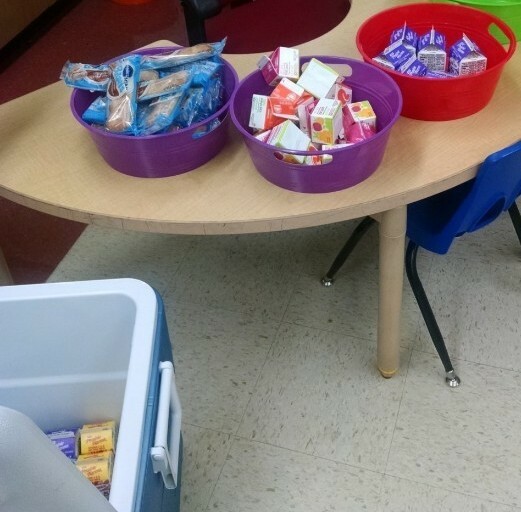 Breakfast in the Classroom ensured that all students had the opportunity to eat breakfast. Q: Did you run into any obstacles or challenges implementing Breakfast After the Bell? A: Technology is really big in our district, every student kindergarten thru eighth grade has access to an iPad both in school and at home for educational purposes so there were concerns about liquids spilling on devices but there hasn’t been an increase on damage to any of the devices. Q: What is the Breakfast in the Classroom process like in your district? A: In our elementary schools, breakfast is delivered in crates to the classroom prior to students coming in so there is less traffic in the hallways. As kids come in to their classrooms the teachers ask those that want breakfast to line up. Kids then go and pick-up their breakfast items. In middle school, kids file in and head to their homerooms. 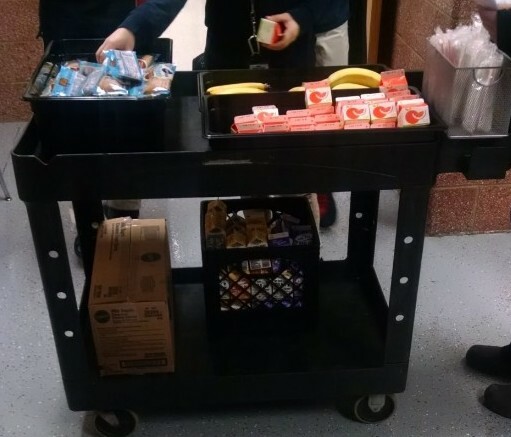 Breakfast is on carts that go around hallway by hallway, classroom by classroom. Teachers ask students that are having breakfast to line up and walk out in to the hallway. Students pick up their breakfast components off the carts then go back into their homerooms and eat breakfast while attendance is taken. Only cold breakfast is served. Garbage bins are stationed in the hallway and kids are responsible for throwing their garbage away. Our food service provider comes and picks up left-overs. From start to finish the whole process happens incredibly fast. Q: What did utilizing the Community Eligibility Provision do for your district? A: CEP made a huge difference in participation. We are in our second year utilizing CEP. Our first year with CEP two schools in the district qualified for it and now in our second year with CEP all our schools qualify for the 100% reimbursement at the free rate. We were doing breakfast in the classroom first then applied for and starting utilizing CEP. At first, we were nervous about CEP and unsure how the numbers would affect our grants, state and federal funding. School districts can’t afford to lose funds or leave funds on the table. Qualifying for the 100% reimbursement did not affect anything on Title 1 or the other funds we were receiving so it was a win-win. Before CEP breakfast participation was really low and now participation is at nearly 70%. Q: What makes your breakfast program a success? A: STAFF! Staff keeps things running smoothly and efficiently. The teachers deserve a lot of kudos for embracing Breakfast in the Classroom. Q: Has there been any feedback from students/teachers/parents about Breakfast in the Classroom? A: From a teacher’s perspective they see an improvement in the kids when they do eat breakfast. Before Breakfast in the Classroom you would see kids come so school hungry and it’s a long time before lunch especially in the middle schools if you are the last lunch period – it’s a good part of your day. Q: Is there any advice you would share with a district transitioning away from the traditional breakfast model? A: It is EXTREMELY important to have the staff on-board for your alternative breakfast program to work and run efficiently.